Heat oven 375C. Place squash, onion and carrot on baking sheet w/salt and olive oil (I would also add a zucchini and whatever other veggies you are trying to use up. Summer squash would taste good as well). Roast 25-30 minutes turning the sheet half way through. Bring chicken broth to boil in a saucepan on the stove, remove from heat and stir in butter, cumin, saffron and salt. Cover pan and let sit 15 minutes. Scrape roasted veggies into bowl. Add couscous. Bring broth to a boil again, pour over mixture. Cover with a plate and let stand for 15 minutes. Add green onions if you have them. 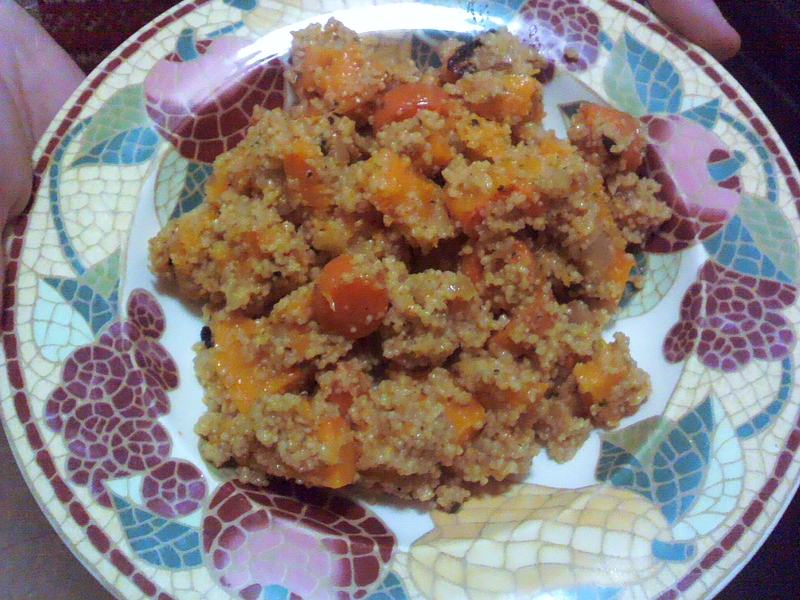 Original was taken from The Daily Green Blog by Alicia Silverstein titles Moroccan Couscous with saffron.